Brian J. McKinnon, M.D., MBA, M.P.H., will speak Aug. 24 at the inaugural Sharon and Dr. Ted Bailey Distinguished Lectureship in Otology at UAMS. McKinnon is a national expert in cochlear implants and the business of medicine. July 17, 2018 | July 17, 2018 | Brian J. McKinnon, M.D., MBA, M.P.H., a national expert in cochlear implants and the business of medicine, will be the inaugural speaker Aug. 24 at the Sharon and Dr. Ted Bailey Distinguished Lectureship in Otology at the University of Arkansas for Medical Sciences (UAMS). The public is invited to the free lecture, “Achieving Financially Sustainable Implantable Hearing Device Programs.” It will be held from 2-3 p.m. in the UAMS Winthrop P. Rockefeller Cancer Institute’s Sam Walton Auditorium. A reception will follow. McKinnon is an associate professor and vice chairman in the Department of Otolaryngology – Head and Neck Surgery and associate professor of neurosurgery at Drexel University College of Medicine in Philadelphia. He is a leader in both scientific research on cochlear implants and on the business of establishing sustainable cochlear implant medical programs for adults and children. He has worked for the White House Medical Unit and serves as a consultant to several organizations, including the U.S. Food and Drug Administration. Hosted by the Department of Otolaryngology – Head & Neck Surgery in the College of Medicine at UAMS, the distinguished lectureship series was established in spring 2018 by a $150,000 gift from Sharon and H.A. Ted Bailey, M.D. Ted Bailey, a 1947 College of Medicine graduate, taught UAMS medical students and residents for many years. He oversaw the Department of Otolaryngology for several years when it was still a division. The Baileys have been steadfast UAMS supporters for decades. The Sharon and Dr. Ted Bailey Distinguished Lectureship in Otology supports lectures, seminars and other educational forums that enable renowned physicians and researchers to share their knowledge and advances in the field. Otology is the study of the anatomy and diseases of the ear. Cochlear implants are surgically implanted devices that bypass the innate hearing process to provide a sense of sound to one or both ears in patients with profound hearing loss. With more than 400 major ear surgeries performed each year, the UAMS hearing and balance team has one of the highest surgical volumes in the country. UAMS Department of Otolaryngology faculty are world-renowned for their surgical and academic leadership in cochlear implantation and other procedures. 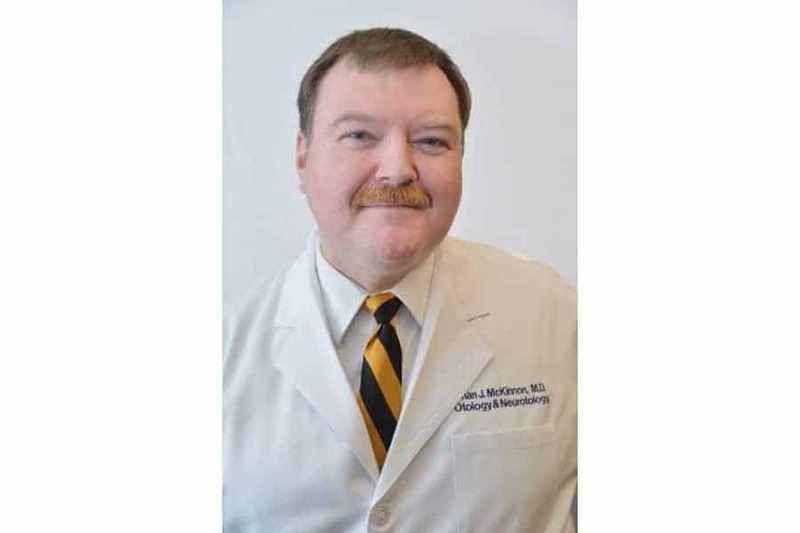 McKinnon has extensive experience in medical and resident teaching, having worked with the National Naval Medical Center/Walter Reid Army Medical Center Combined Otolaryngology Residency Program, Georgia Regents University, The Shea Ear Clinic and the University of Tennessee. He maintains a private clinical practice in Philadelphia.